Bamboozled September 25, 2017: 3 banks and a missing $500 check. Where did this customer’s money go? Margaret Fittin likes to pay her bills in full. But now, one of her payments is missing. Three financial institutions, over more than four months, weren’t able to figure out what happened. And then there was finger-pointing, which wasn’t doing anything to make this wronged customer whole. In May 2017, Fittin received a bill for her Discover credit card, and she paid it the day after. She wrote a check for the entire $503.61 balance from her Bank of America checking account. All was well, she thought. Then she received her next month’s Discover bill. It included her new purchases, but also the $503.61 amount she paid the month before, with a late fee and interest charges. Fittin said she called Discover, and a rep said the company never received her check. Next, Fittin checked with Bank of America. The money was indeed out of her account. She sent Discover a copy of the cancelled check and waited for an explanation. She received a letter from the credit card company on June 28. Not wanting to incur more interest charges, Fittin sent a new check to Discover to pay off the balance. Discover, as a courtesy, removed the $27 late fee and about half of the interest charges. Fitten went back to Bank of America. At her local branch in Glen Ridge, she registered a fraud case, she said. Discover said it never received that first check from Fittin, but Bank of America removed the money from the account. We reviewed Fittin’s credit card and bank statements and a copy of the cancelled check. The back of the check, which would normally show a signature or stamp and a bank account number for the person or entity that cashed the check, was blank. It seemed as if no one endorsed the check. We turned to Nessa Feddis, the American Bankers Association vice president for consumer protection and payments, to understand who might be responsible. She said payment system rules put the liability on the entity that’s most able to prevent possible fraud. “In this case, when you’re looking at a fraudulent endorsement, the bank that takes the check for deposit or cashes it is generally responsible for ensuring that the person depositing the check or cashing it is the person named on the check as a payee,” Feddis said. She said the institution that accepts the check from the person presenting the check has the best ability to manage the risk because they have a relationship with the person depositing or cashing the check. “Sometimes systems aren’t perfect and some things may fall through the cracks,” she said. But this crack was a big one for the customer, and until it’s resolved, Fittin is out more than $500. The front and back of the cancelled check. Looking more closely at the check in question, the back of the check offered a clue we initially overlooked. Listed there is JP Morgan Chase Bank as the “Rtn Loc/BOFD,” which stands for Return Location/Bank of First Deposit. That means the check was presented to JP Morgan Chase, which okayed the cashing of the check. Bank of America is listed as the “Pay Bank,” or the bank that paid the funds out of a customer account. We reached out to Chase, and while we waited for a response, we checked with Bank of America. Chase wasn’t able to give anything more substantial. 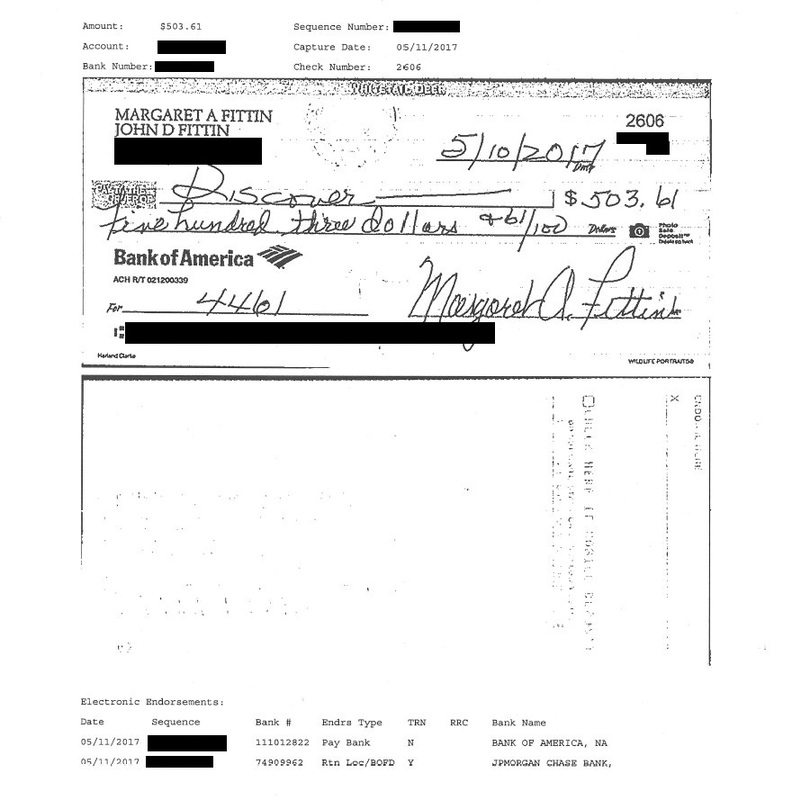 It said it hadn’t yet received any claim from Bank of America about this check being a problem. We asked Bank of America to see if it had involved Chase in its investigation. We didn’t get an answer, but Fittin received a call from Bank of America. Even though she had already filed a fraud complaint through her branch, Fitten was given a new fraud investigation form to complete. “This is probably because of you getting involved and now they’re doing something about it,” Fittin said. She said she worked with the bank manager to complete the fraud forms and make sure they were sent to the correct Bank of America department. So maybe Bank of America never took the step to pass Fittin’s initial complaint to Chase? Discover, in the meantime, had no comment other to say it didn’t receive the payment, and Fittin needed to check back with her bank. We gave it more than a month, and we checked back in with the banks to see where this case stood. Bank of America confirmed it gave Chase the information it had a month ago, but Bank of America said it hadn’t heard of any resolution yet. We tried to reach Chase all last week, but it didn’t answer our calls or emails. Until Friday night, just before our deadline. That didn’t jive with what Bank of America said. We went back to the bank, which confirmed it passed the information to Chase on Aug. 16. At this point, does it matter? Because as this all hashed out, Fittin didn’t receive a phone call from anyone about this alleged refund. It’s no wonder she was frustrated with all the “customer service” she received. We hope to have good news for Fittin today.